The Duo PLE is ideal for shop floor replenishment, stock picking and short-distance pallet transportation. A few examples of ideal uses are in warehouses, supermarkets and production areas. The PLE pallet jack comes with an ergonomic lift function, allowing for stock picking at the “golden zone”/ waist level. This unique pallet lift function increases stock picking productivity and takes strain off the operator’s back, ultimately reducing worker comp claims. The PLE offers optimal efficiency, handling two pallets at a time – one on the forks and one low pallet on the straddles. Specialized wheels make it easy to move the lift truck upward on steep angles and handle heavy loads on different types of pallets/ load carriers. 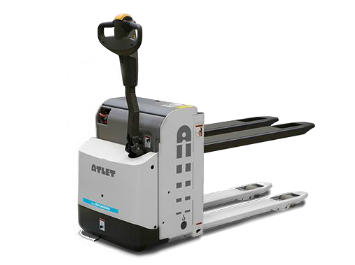 The Atlet Duo PLE offers two functions in one lift truck: a pallet jack for heavy loads and an ergonomic pallet lift function for quick and easy stock picking. Other features: Atlet Modular Concept design for highest First Time Fix Rate. AC motor for reduced maintenance plus maximum acceleration and drive speed. Four-wheel design for maximal stability. Patented 4-point Friction Force chassis for improved stability and traction. ATC truck computer with PIN code access for onboard diagnostics, optimum performance settings and to prevent unauthorized use.